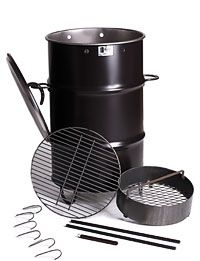 This home use and competition cooker/smoker is a one of my favorites. I tested this cooker for use in my BBQ Classes and just fell in love with how it cooks. I loved it so much I decided to sell them. Build a small fire in the basket, load the meat, and let it alone. The temperature is preset at the factory for slow smoking and stays at about 225-250 degrees constantly. One thing that is really special is the way you can hang the meat. This is the way to cook real barbecue! I have never seen a better cooker for the money in my 30 plus years of cooking barbecue. It comes ready to use in minutes! Ships right to your door for no extra charge. What a deal!